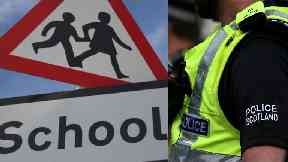 School: Police were called to the primary. A 12-year-old boy has been charged by police after allegedly taking a pen knife into school in Angus. Officers were called to the primary after the pupil was reported to be in possession of the blade on Monday. The boy is said to have concealed the knife in his pocket and did not brandish it or use it to threaten anyone at any time. Although the 2.5-inch folding pen knife would be legal for an adult to possess in a public space, the schoolboy will be reported to the youth justice assessor for his actions. A Police Scotland spokesman said: "Police Scotland can confirm that on April 1 a 12-year-old boy was charged with having a pen knife in his possession at a school in Angus. "The matter is to be reported to the youth justice assessor." An Angus Council spokeswoman added: "Angus Council can confirm that a 12-year-old boy was reported to Police Scotland on April 1 for having a pen knife in his possession at a school in Angus. Just last week a 12-year-old girl was charged for allegedly taking a knife into school. Police were called to a school in Musselburgh, East Lothian, after the pupil was said to have showed the knife to a child in the playground. A member of staff was alerted before officers were called shortly after 9am last Thursday. Police confirmed a report will be submitted to the Children's Reporter.